#51 One Quick Way to Propel Your Business – Become An Author! Have you ever thought about becoming an author? Writing a book can be a powerful way to propel business at your child care center, daycare, or preschool, elevating you to an authority figure and immediately making you a local celebrity. 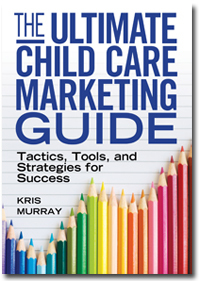 I’ve used this strategy myself by writing The Ultimate Child Care Marketing Guide, and it’s become a go-to resource for those in the child care industry and a key factor in the success of my business. I knew when I got into the child care industry that my credibility as a trainer, speaker, and coach would be skyrocketed with one single tool – a book. And it did! You can do the same thing at your own business. If you write a book related to the child care industry, parents will start to see you as an expert on the subject of child care, creating a sense of trust and admiration. This will carve you out as a leader in the field helping you attract more clients, allowing you to charge more, and helping you get the name of your child care center out there. Some of you may have already wanted to write a book for a while but you’re not quite sure how to get published. There are actually some very easy ways to do this. 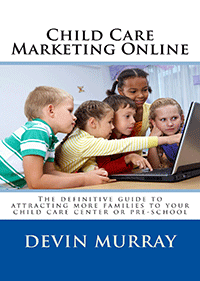 My husband Devin just went through the process with his book, Child Care Marketing Online. He was able to write, edit, and publish it on a tool called Create Space, which then has Amazon print it on demand. There is even a way to get a Kindle version published via Create Space. This is an extremely inexpensive way to get your book out there and have instant fame! Some examples of topics you could write about relate to early childhood education, curriculum, parenting, discipline, behavioral problems or whatever you may be passionate about that connects you to your core business. You can start out by writing a guide, a pamphlet, or even a quick consumer’s guide. Whatever it may be, becoming an author immediately makes you an authority in your field. So take some time to think about how you can become the publisher of your own ideas to get more local celebrity attention at your child care center, daycare, or preschool. Get started today by thinking about a topic you want to write about, create a book outline and set a goal for yourself for 2014 to become an author! 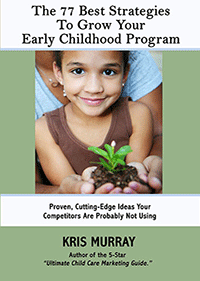 Check out my own book, The Ultimate Child Care Marketing Guide, here.